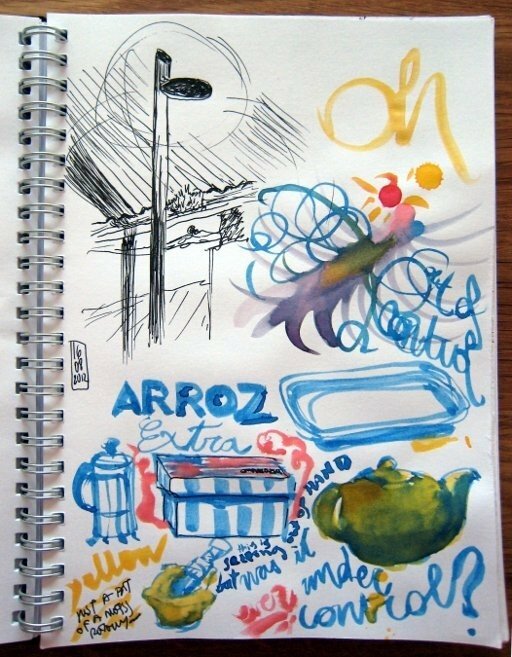 The last time I did outdoor-sketching I experimented with painting directly from the watercolour pans, using a water brush pen only. 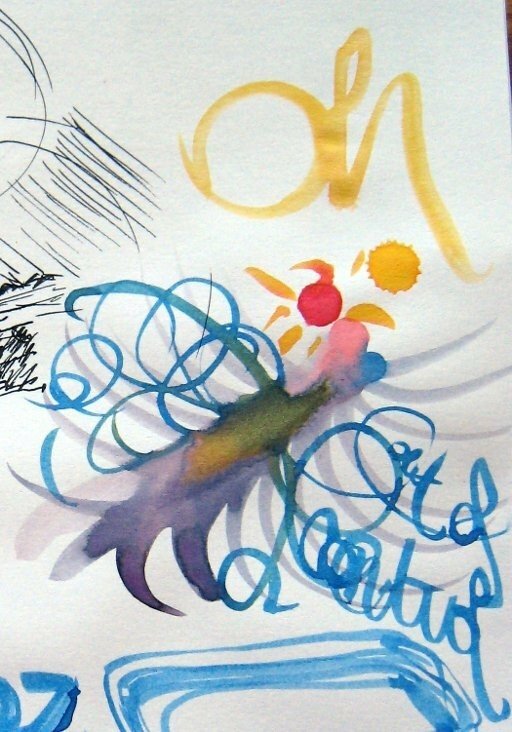 I quite liked the spontaneity and the type of lines and other "accidents" that I could get with this method, so I wondered if I could use the same sort of wet medium (the water brush pen) but with the colour already "loaded" in, so that I could draw and draw and not worry about reloading the brush with more colour from the pans. I removed the needle, and also tried to not to look at it too much, as needles scare me! But I didn't dispose of it, because I want to use it for refilling an Ahab fountain pen that I can't manage to fill with its inbuilt piston mechanism. But I'm digressing! Back to my tests: I thought I would prepare a versatile palette which would allow me to mix the colours and generate many more shades. So I chose yellow, red and blue. In theory this "should" work, right? Or at least approximate to the CMY print scheme (Cyan / Magenta / Yellow - yeah, I left the blacK out!). As you can see, and as we expected, the colours were a bit more toned down than if we had used more primary colours. 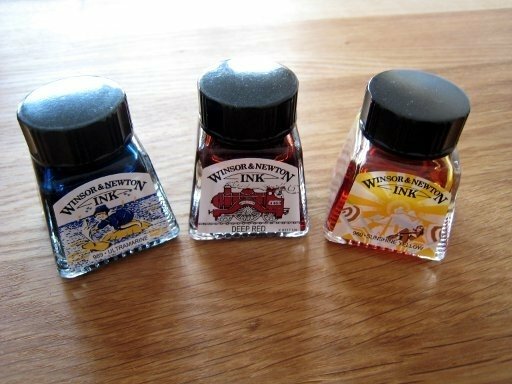 The other problem is that the ink doesn't seem to want to mix with the other inks. This could be a fault of the paper, which might be absorbing ink too quickly. The other issue is that except the blue-loaded brush pen, the other two were pretty thick, and due to the way I hold the brushes I was actually pressing on the reserve, so I got several accidental drops in the paper--that I tried to use to my benefit ;-)-- and generally the brushes were a tad too overloaded with ink, so everything was pretty much out of control. Here's a detail of the area where I truly attempted to mix colours, and where I got a couple of accidental drops too. I like the curly blue lines, and the "Oh" with its accompanying yellow drop too, but the greenish-yellowish-violet stain is just gross. On Sunday we made an impromptu visit to a beach we had never been before, yet had passed by many times already (with the train): Garraf, an small port-village close to Sitges, and which was famous (to me) because Krampack was in part filmed there, so I was really looking forward to visit it and do a bit of movie-location-spotting. Once that was done (it didn't took long as the place is very small) and we had lunch we went to the beach itself, where I took the opportunity to do another test with my "primary" colours array. 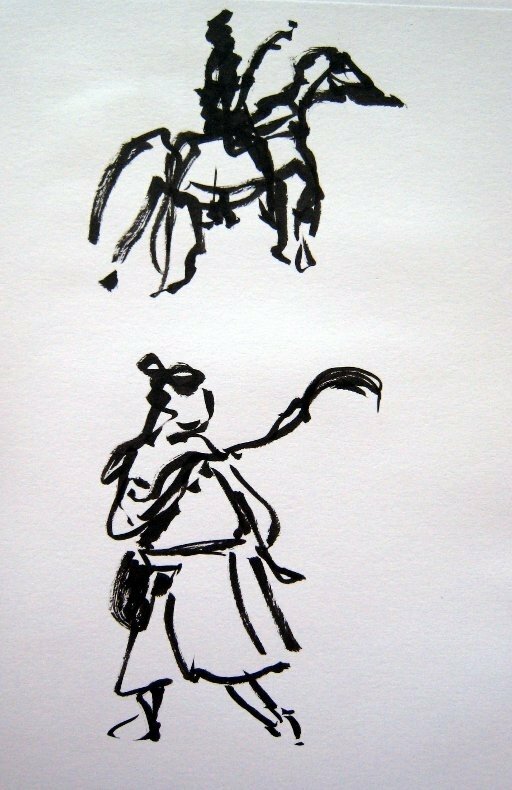 This time I thought that, since the media didn't lend itself to detailed, intricate work, I would use wider strokes and not worry much about detail. 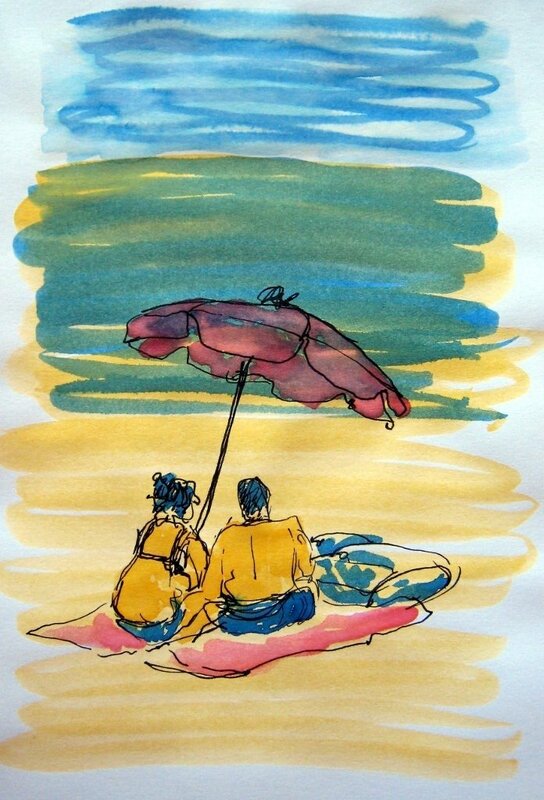 So I drew this sitting couple under the sunshade, and "went crazy" again, as I applied a layer of yellow to most of the page, not really caring about accuracy. I decided I would use the half top of it as base for mixing blue and getting a sort of turquoise-aquamarine colour, but what happened is that the sun was burning SO HOT that the yellow ink had almost dried when I applied the blue one, so they didn't quite mix as I expected! Therefore I thought I would wet the entire "sky" area with plain water before applying the blue ink, but maybe I didn't wet it enough, as the ink seemed to be absorbed quite quickly and didn't spread as much as I expected. Booh! 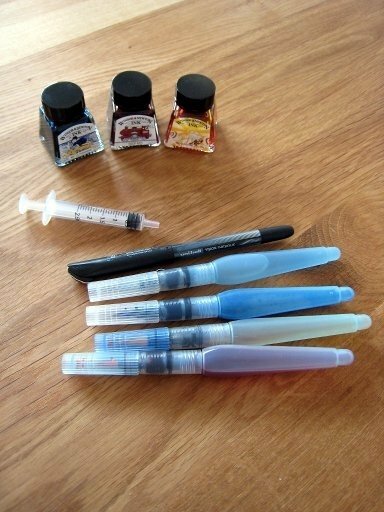 I hadn't used the red ink yet, and the bodies were empty! At this point, looking for proper, realistic colours, was a bit silly. So I just coloured the rest as I felt: more yellow for giving some sort of volume to the bodies, red for the sunshade and towels, and blue for hair, bikini and swimsuits. I like the result, although it's not exactly what I had in mind, but looks nice. It also reminds me to old duotone-printed comics which tended to use raw, plain colours instead of moire-based gradients. I think this technique could work with a little more practise, so I might experiment in more settings and with more ink colours, as I still have four more bottles to use. And since I already discarded realistic colouring, I can use crazy combinations such as "Brilliant green", "Purple" and yellow. I'm also happy that I found a brand of 0.5 pens that are really waterproof and not only "sort of water resistant". 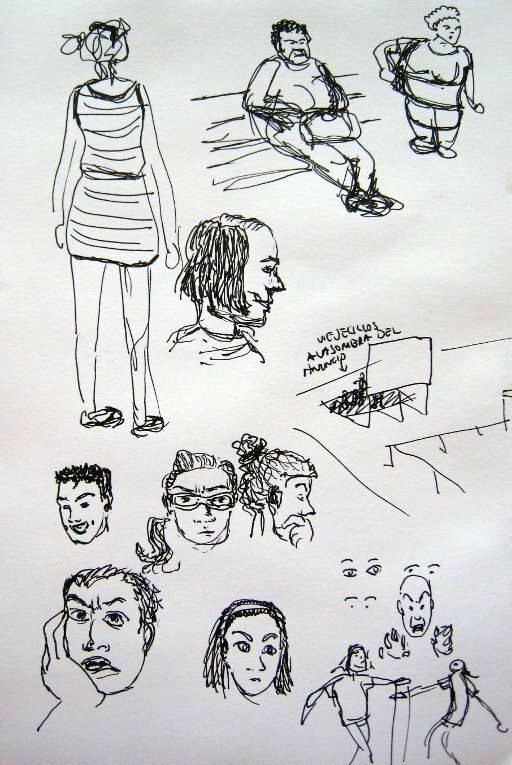 The one I used on this drawing is a Mitsubishi uni-ball 0.5 vision needle micro. Its label says "waterproof/fade-proof", and so far it's not feathering when I apply water afterwards. It's not a roller ball pen, but it's got one of those metallic points, like the early Pilot Hi-Tecpoint V5 we all know and sometimes love. I would say the ink in the Vision needle is a bit more liquid than in the Pilot, so it flows well. Prior to this I attempted to use Mitsubishi uni-ball eye micro (notice "eye" instead of "vision needle") and those were not waterproof, even if their label said so. Water-resistant maybe. Though you could get some nice results, if feathered black lines is what you're after! I think I didn't keep any of those drawings, so I'll try to do a new one, but only if the decorations are bulb-based!